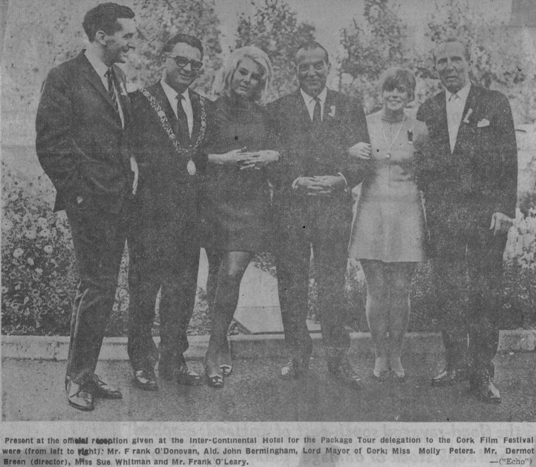 IN THE good old days, 45 years ago, Cork boasted a “prestige” film festival, whose committee, in the words of founder Dermot Breen, “didn’t wish to be classified as long-haired cranks of the cinema”. We’ve come a long way, baby, and long-haired cranks are now the toast of what is generally accepted as the “people’s festival” of the film circuit. Never mind those brash newcomers in Dublin and Galway, says Sarah Caden in recent years, Ireland’s best film festival has been the oldest one beside the Lee. Celebrating its 45th birthday, this year’s Cork Film Festival programme has been welcomed as one of its most comprehensive and all-embracing yet. It opens next Sunday with Gerry Stembridge’s black, satirical morality play, About Adam, starring the next big Hollywood thing, Stuart Townsend. Opening night is still all about shaking your jewellery, one festival regular says, and Montenotte doctors checking out each other’s spouse’s diamonds, but once that’s over, the festival is about showcasing less ordinary film for the ordinary people of Cork and playing host to the thousands who visit, loyally, each year. Feature highlights this year include Dancer in the Dark, The House of Mirth, Faithless, Woody Allen’s Small Time Crooks, and Purely Belter, from the director of Brassed Off and Little Voice. As highlights, they’re a pleasant mix of highbrow and intelligent middlebrow. Lars Von Trier’s Dancer in the Dark works on two levels first, for the prestige of having won the Palme D’Or at Cannes, and second for the pop culture value of having Bjork as its barmy leading lady. The House of Mirth, a graceful adaptation of an Edith Wharton novel, stars Gillian Anderson from The X-Files, while Faithless is a collaborative work, written by Ingmar Bergman and directed by his partner, actress Liv Ullman, about the flawed nature of long-term commitment. Allen’s contribution is one of his comic rather than serious projects, thank God. Some say Cork Film Festival’s greatest strength lies in its longevity, in that it has settled into a groove as a festival accepted by its citizens and confident of its criteria. After a dip, more than a decade ago, in both popularity and quality, it has flourished under the directorship of Mick Hannigan and was a forerunner in showcasing and rewarding makers of short films. Its short film awards are now a mainstay of the film industry calendar and this year, with £57,000 to dole out, they’re a force for the other festivals to contend with. The documentary film category is one of the strongest in the Cork Film Festival programme this year. A poor relation, in some ways, to the more instantly appealing feature films and accessible shorts, the programme includes directors of note andsubjects of universal interest. Nina Davenport’s Always a Bridesmaid takes a thoroughly modern look at the difficulties of meeting a man for keeps, while The Bradfords Tour America follows a gay man and lesbian woman around America, where they pose as man and wife with two wayward kids. Oscar-winner Kevin Macdonald brings his study of director Erroll Morris and Armagosa is the Oscar-nominated story of cancer-striken dancer Marta Beckett. Though some people take in all three of Ireland’s major film festivals, Dublin, Cork and Galway, for most of us one a year is about all we can manage. So if you attend only one film festival this year, why should it be Cork? The Galway Film Fleadh is, without doubt, a summer festival highlight, much prized within the native industry for its support of Irish endeavours. Every night, it boasts an Irish premiere, and the Fleadh Festival is renowned as the place to meet big-shot financiers and filmmakers. The downside is the social scene, however, which is considered to be elitist, if only because so many people wish to be part of a small group the Festival Club is literally too tiny to welcome everyone. Dublin, on the other hand, is almost entirely scorned by film festival types, who feel that the content is unapologetically blockbuster- and star-driven. Cork, the old master, seems to blend the social and the artistic almost seamlessly. The Opera House plays to an audience of half-Cork, half-visiting enthusiasts every night and everyone is welcome in the bar later. They’ve been practising a long time, but practice makes near-perfect. If there is anything lacking in this year’s festival, it is star presence. Gerry Stembridge and his producer, Marina Hughes, will be there, as will David Collins of The Most Fertile Man in Ireland, but no big glamorous names. But anything could happen, however, and anyone could show up. And I should know I met my husband there. * The 45th Cork Film Festival begins next Sunday, October 15 2000.